Turner’s Contortionists & Acrobats is a professional performance troupe based out of Vancouver. We are fully involved in the Movie (Stunt/Feature), Commercial and Ad Industry. We specialize in unique customizable shows offering one of a kind live entertainment featuring contortion, dance, acrobatics and aerial silks. Through the use of original music, visuals and costumes, we cater to every aspect of your entertainment needs. From a single performer to full scaled productions inclusive of live singing, instruments, and choreographed themes, we can create a show that will leave you bending over backwards for more. 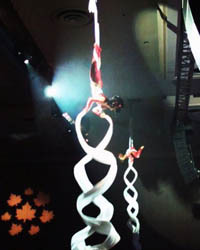 Turner’s Contortionists & Acrobats offers custom shows for your event. Extreme flexing of the human body, high flying aerialists, fire effects, live music and vocals come together to create a dynamic entertainment experience.